1. 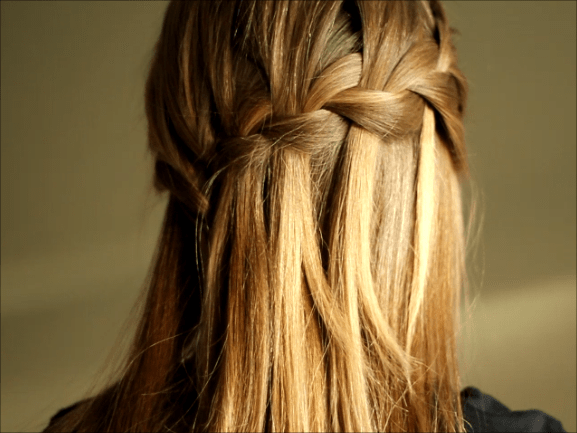 Begin with a French braid over your right ear. 2. Start the waterfall portion by pulling the left strand into the middle. 3. Then, take hair from the top and pull it into the middle as well. 4. Next, take the strand on the right and drop it down. 5. Pick up a section of hair that is directly behind the strand you dropped. 6. Place this section into the middle part of the braid and continuing this method working towards the left side of the head. 7. Once you reach the left side, drop the strand of hair on the right as usual. 8. Then, wrap the left strand over the middle piece and place a bobby pin over the strand and secure it in place. If I lost you, here’s a video that might help.